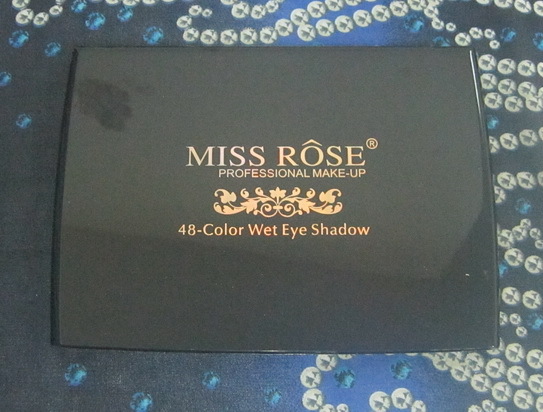 My mom went to visit a friend a few weeks ago and came home with two makeup palettes, which brand i've never heard of. 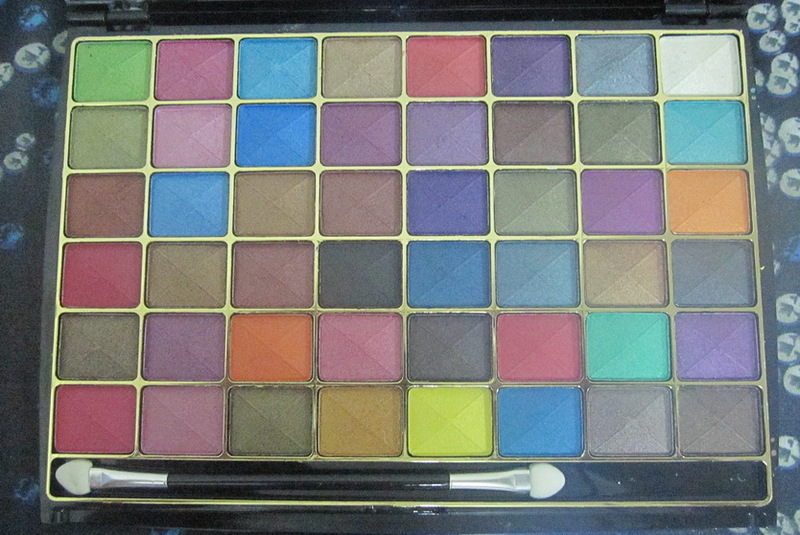 One palette has 48 colours and the other maybe 108 colours? I had a look inside and immediately liked the look of the shadow. 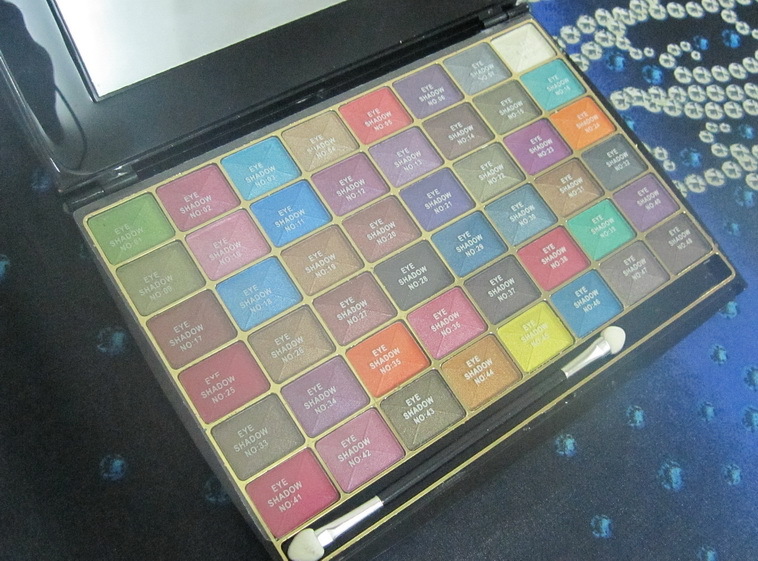 Since i've never heard of the brand, i thought the wise(r) thing to do is get the 48-colour palette, which the friend was selling for RM 26 - by the way i've read reviews online where some people got it for RM 25 and RM 20, so you can look around for the best bargain, i'm sure. 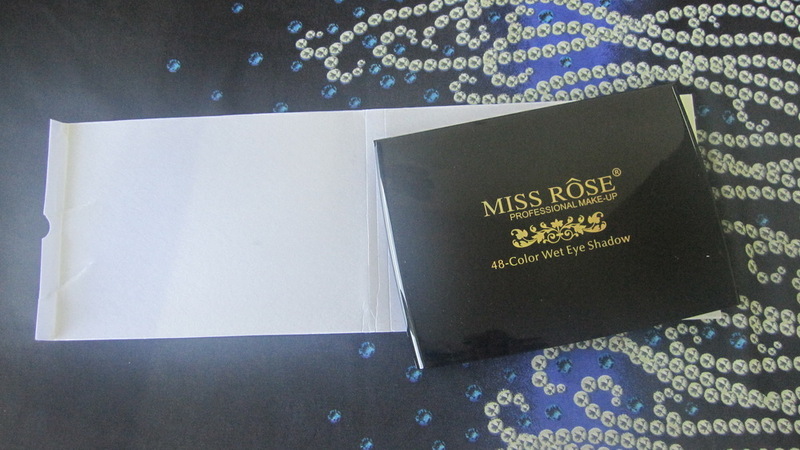 The brand is called Miss Rose. The friend told my mom that local pro makeup artists use this too; i assumed she was referring to 'mak andams', which my sister (who is a part time model) verified. So that was good news and a good reassurance. 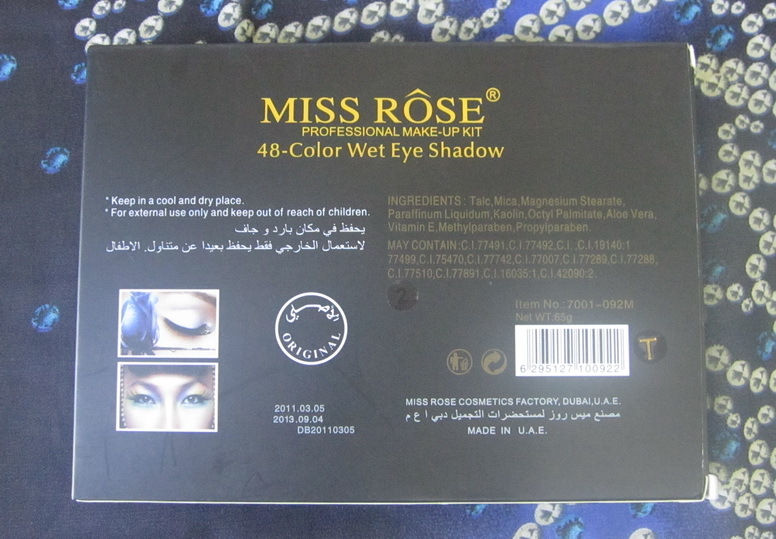 So, yes, it's written "MISS ROSE PROFESSIONAL MAKE-UP", "48-Color Wet Eye Shadow", "Wonderful Colors create pretty eyes", "Double Moisturiser With Aloe Vera & Vitamin E" (moisturising eyeshadows? that's a first. or is it?...) 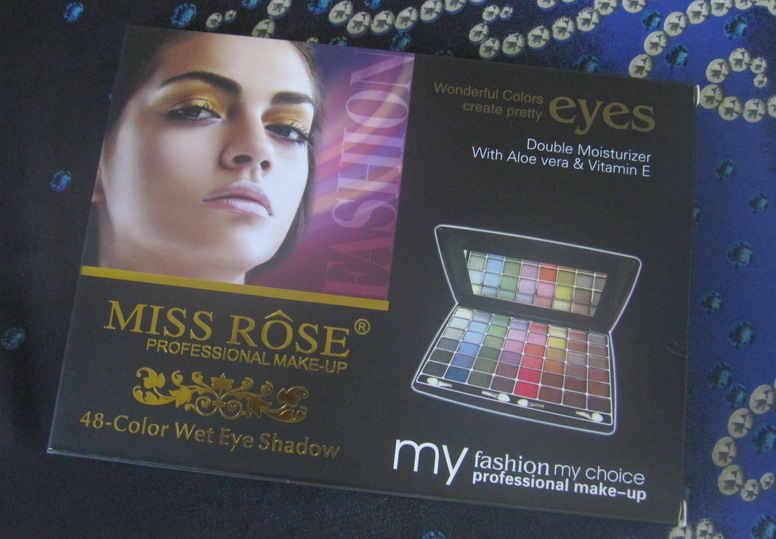 and finally "my fashion my choice professional makeu-up", all on the box. The palette inside has a protective cover, made of some sort of polystyrene (i have no idea), which i think is to absorb a small amount of impact in case it makes contact with anything hard. 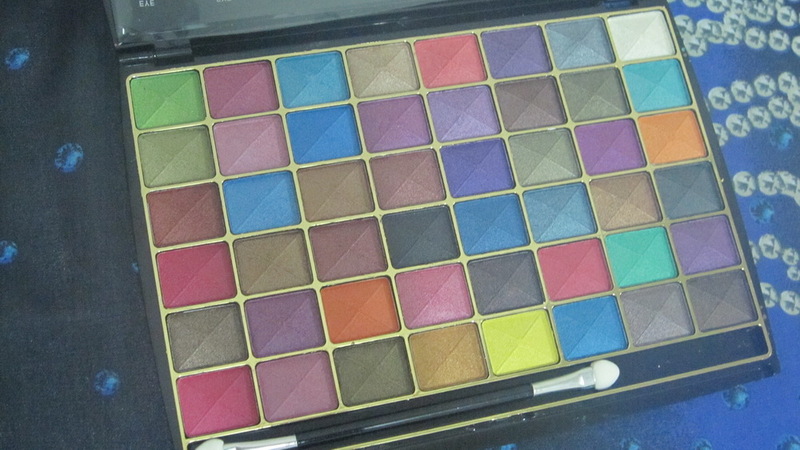 This palette has 48 colours which they named "Eye Shadow No : 01", "Eye Shadow No : 02" and so on until "Eye Shadow No : 48". All 48 colours look amazing! 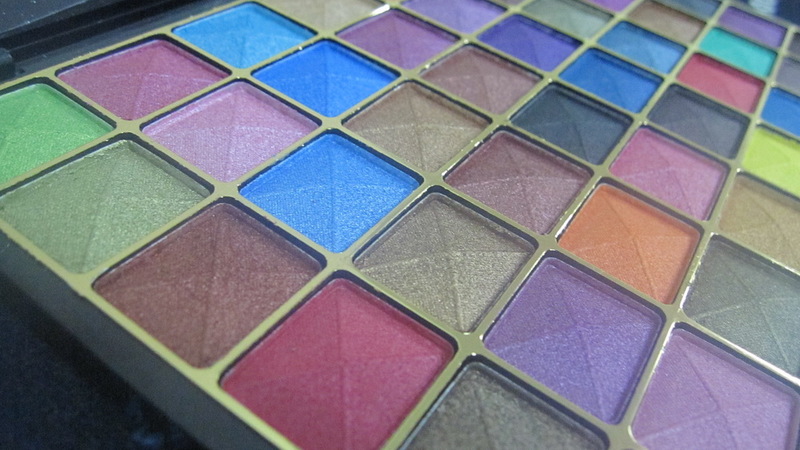 I LOVE the vibrant, colourful hues that are available in this palette. I'll be honest though, i wouldn't have a clue on how to use most of the colours here: yellow, deep pinks, bright blues, that orange. I voiced this concern ("concern"?) to my sister, something along the line "What in the world can you do with these colours? I mean, yellow eyeshadow??" to which she answered professionals would know what to do with them; it's all about blend, blend, blend. So, yeah. It's a mystery to me, but if i get the chance to learn to do those things, i probably would love to! 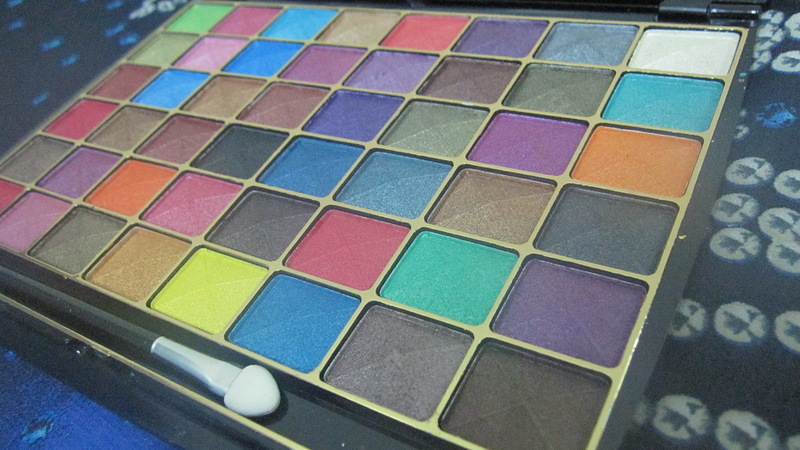 If you're wondering why they're called "wet eyeshadows", it's because they do give a slightly wetted impression. Which is fabulous! They go on smoothly and LOOK smooth. The finish i would say is a really nice, beautiful satin. I'm not sure if i'll ever do swatches for all of them, i can certainly try! Or else i might just do my favourite colours, so watch out for that! My sister wanted convincing on buying the other 100-something colour palette and asked me to try them out. I did. And she bought it. Thanks for reading! Hope you like the palette as much as I do. Will check the product. I believe this will boost my dream to become a professional makeup artist.